PLEASE NOTE - We directly contact each guest PROMPTLY and have a 100% response rate despite the fact we do not respond in the VRBO dashboard. We personally manage every single booking from start to finish for our property - Pu'u Poa 306. We do not advertise on Craigslist and no other property management/rental agent is authorized to book our unit and receive funds for us. (i.e.pro luxury vacation, home at peace, etc.). MAHALO NUI FOR YOUR INTEREST IN OUR KAUAI OHANA! Pu’u Poa #306 is a beautiful 2000+ sq. ft. luxury corner unit condo on the 3rd of 4 floors. This property is more like a vacation home than a vacation rental because of all the special luxury amenities, personal touches and the beautiful birds-eye view of the Pacific Ocean, Bali Hai and breathtaking sunsets. When there are no clouds on the horizon - watch for the green flash! And, at the end of the day let the gentle sounds of the surf lull you to sleep and then greet you the next morning. This is a premier luxury unit at Pu’u Poa offering amenities and views above and beyond other properties in the area. 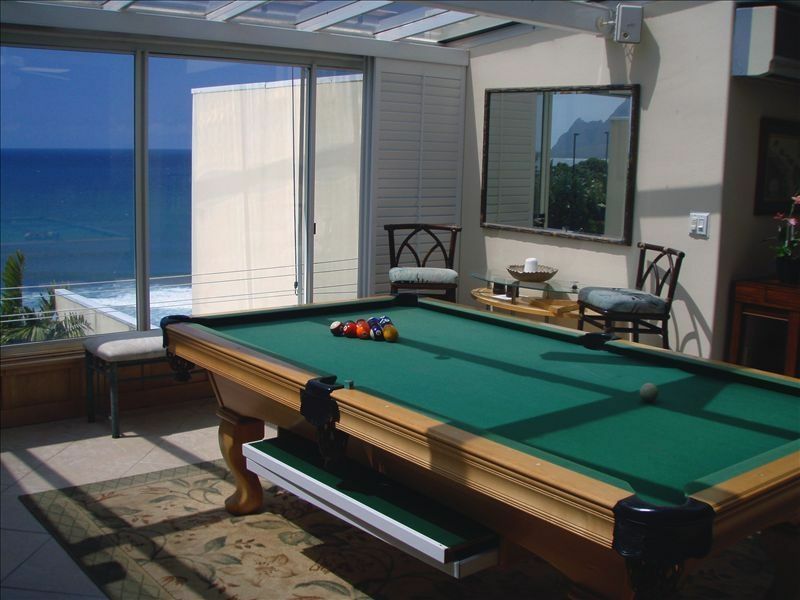 - Located next door to the 5 Star St. Regis Princeville Hotel at Hanalei. - Situated on an ocean bluff above Hideaways Beach. - 5 minutes walking to Hideaways Beach below condo or to beach at the Hotel. - Princeville Golf Course and Makai Golf course very nearby (drive or walk). - Restaurants nearby (drive or walk). - Massages, yoga studios and fitness centers nearby. - 15 minutes drive or 10 minute walk around the point to Hanalei. * This property has recently been upgraded and we are always doing little things here and there along the way. We offer only the highest amenities and wonderful ocean/Bali Hai views. Note: Photos taken with point and shoot digital camera. We have spent more than 25 years living and visiting Kauai. We still spend much of our time at Pu'u Poa #306 and enjoy sharing our Hawaiian home with others when we are off island. We chose Pu'u Poa #306 because of the location and that wide open ocean view! The Pu'u Poa development is the only one of it's kind on the island. Located next to the premier hotel on the island --- Perched atop an ocean bluff overlooking Bali Hai and the Pacific. We have 2 full walls of view along the front of the condo showing nothing but beautiful shades of blue ocean. And, the view is pretty close to the same from side windows in the kitchen. #306 is also angled so that nice trade winds pass thru and the hot sun does not bear down on this unit so it is always pleasant. When we arrive on island, we seldom leave the condo. The view is wonderful, we enjoy cooking and grilling on the lanai while listening to some nice island music and you never know how crowded the island is while here. Because we have lived here for years and still spend extended time here, we offer amenities and personal touches not found in any other vacation property. Hideaways Beach is just below and Pu'u Poa Beach is next door and accessible by stairs behind the St. Regis Hotel. Views of mountains from guest bedroom and master bath windows and some areas of main living area and lanai. Pu'u Poa #306 is one of the closest units to the edge of the bluff so the view is truly bird's eye. All around ocean views and Bali Hai view. Secure wireless. Security code will be provided with entry information and instructions. (2) Side by side with exterior ice and water access and water filter. Wine Chiller. Mini Fridge in game room by front door for beverages. Hawaiian Music and various other artists. +400 plus titles of all genre for all ages. Ratings from G to R.
Game Room with Pool Table/Ping Pong/Air Hockey, Custom Refreshment Bar/Built-in Seating. We had to cancel due to illness and owners went out of their way to assist us. From the moment you step through the threshold of this condominium, you will be delighted. From whale watching on the lanai to the lull of the waves below, the location is ideal. The condo is spacious with cooling crosswinds. Eden and Jennifer have every detail thought through including, beach towels and snorkel gear, as well as a fully decked out kitchen. I highly recommend this island home away from home. Hawaii is always lovely and it was nice to stay on the north side of Kauai and see Hanalei Bay and vicinity. The condo is well laid out, with lots of room for just my husband and myself. We would have liked to see a small welcome basket including coffee to get us started. We did get five small cookie packs - tasty! There are many condiments to be found in the cupboards and some in the fridge. These are helpful. We left some as well upon leaving. We left a written note for the owners regarding some items that need repair and requested they acknowledge the note. They did not. The worst issue is the lower cupboard that is full of mold, and moldy games! We know it rains a lot on Kauai but during our visit we toured another condo at Pu'u Poa that had NO mold. The agent said she has never seen mold in other condos she has sold. Little things like the reading lamp in the master didn't work; the printer was advertised as available but we were unable to use it. A message said the printhead had a problem, as well as the ink being quite low. We enjoyed the pool table and washer and dryer. The kitchen is well equipped, although a decent non-stick skillet would help. The bed was super comfortable; however, the pillows were awfully soft and had to be folded over to sleep decently. At $335 per night this condo was slightly disappointing but with a few small repairs could be marvelous. Great location for a quiet getaway! Comfortable furniture, clean and everything promised was delivered. Great place for a couple or the entire family. Thank you. This was our third stay in this condo. It is a beautiful condo and we have always loved staying there. However, this time, we definitely noticed that it was in need of some TLC. Of most concern to us was that there had been an odor upon entering. We were coughing which we have never experienced before and two days before we left we found a cabinet full of mold. We took the time to email the owners a very nice email to say we knew they lived away and may not be aware but their condo was not up to what it should be etc and that the place just didn’t feel clean and that we had now found mold. Their response was a simple thank you. Mold is a very serious issue and they gave us the impression that they could have cared less. Having been condo owners ourselves, we would have been SO appreciative of being notified and MORTIFIED that this had occurred. I only share this review as you should ensure that problem has been addressed and the place given a good thorough cleaning before renting this unit. Loved this condo, it met our needs perfectly! Plenty of room, had everything we needed. Location is great for the north shore, easy access to everything on the north shore. So spacious and comfortable with magnificent views and proximity to everything on the north shore. I would highly recommend and if I ever have the opportunity to return to this breathtaking island I will not hesitate to stay here again! A midstay clean will apply for dates beyond 9 days. Rates are subject to change until reservation is confirmed. NOTE: Payment terms are 1/2 rate plus security deposit paid up front. Balance is due 60 days prior to arrival. Email to inquire about availability.